No tricks and no fancy play on words today. 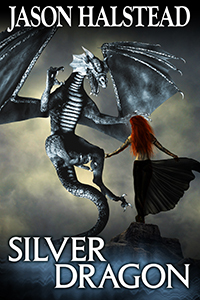 This post is about the release of my latest novel, Silver Dragon. I’ve blogged about it a few times but now it’s finally here. Silver Dragon is the third book in my Blades of Leander Series (Child of Fate and Victim of Fate preceded it). It picks up the story immediately after Alto has buried his fallen loved ones and follows him on his path of revenge. Rather than waste time trying to drop teasers without spoiling the story, here’s the blurb, cover, and links. If you enjoy an epic fantasy that has a little bit of everything in it, head on over and pick it up. Alto’s hands are stained with the blood of the fallen. The only justice he can find must be had by the blade, but the path of vengeance shows him that he is but a pawn in a far more dangerous game. Sarya’s plans reach far beyond anything the young warrior could imagine and require a sacrifice from him greater than he can give. Alto must make fear his ally if he is to lead his companions into the dragon’s lair with any hope of saving the woman he loves and the two nations he calls home. Wait a minute, I’m a writer. What the heck am I talking about burning books for? Especially given the positive context? Have I written one too many twisted scenes and pushed myself off the cliffs of insanity? To the latter question: well maybe, but I leave that for those who know me best to decide. I don’t encourage or suggest burning books at any time though. Well, unless you’re trapped in an arctic wilderness and you need a source of heat to keep you warm and keep the hungry wolves at bay. I’m talking about what I just managed over 8 completely normal days. 8 days where I spent time with my family, working out, and having a day job. 8 days where I wrote a book. A novel. 62,000 words. In 8 days. In case you haven’t noticed, I’m pretty darn pleased with myself. I do not, however, expect to be able to maintain a pace like that. It did require some sacrifice on the part of my family and for that I’m grateful beyond words. Still, the book burning referenced in the title applies to the speed of the digital pen on the digital paper. You know, digital friction and stuff. Right, moving on. It’s a good book too, I’m going through a self edit before I send it off to my editor this weekend. So far I’m adding some content here and there and straightening confusing bits out. Really enjoying the story though, it’ told from the perspective of Stephanie Martin, a young lady whose life was just turned upside down. You see, she was skipping school one day and stopped to grab some caffeine and a pack of smokes when she ran into this amazing woman and made the mistake of looking into her eyes. That’s all it took. Her soda hit the ground and she realized everything had changed. She had no idea why until the woman took her and led her away. Weird turned to crazy when the woman explained that she was a witch. In spite of how impossible it was, Stephanie believed her. Then her new mistress showed her the magic that she could one day possess. It’s not all broomsticks and cauldrons for a witch though. Stephanie’s new life exposed her to cruelty and injustices beyond anything she’d imagined. The savagery of the Dark Earth her mistress took her required her to embrace the savage within her if she wanted to survive. Soulmates is a story of human spirit and the things that can happen to it. The book explores how much pain and evil we can endure. At what point does the human spirit give up or become too stained with sin to recover? How hard must a person fall before they understand that life isn’t about hitting others, but learning how to survive being hit themselves? Soulmates is the third book in my Dark Earth series. It follows Devil’s Icebox and continues to touch on the lives of Eric and Jessica Baxter, Lady Cassiopeia Nelson, and the rotten men and women that seek to ruin them all. It is a testimony to the sadistic nature of the culture of the earth’s parallel world that a juvenile delinquent with a manipulative and troubled past can hope to bring light to the darkness. It’s being edited now, I hope to have it available in early March, following the pending release of Silver Dragon.